JPMorgan Strikes Tentative $13B Mortgages Settlement : The Two-Way Multiple news outlets, including NPR, have been told that the bank and the Justice Department are zeroing in on that figure. At that level, the settlement would be the largest in U.S. history. JP Morgan Chase & Company headquarters in New York. In what would be the largest such settlement in U.S. history, JPMorgan Chase & Co. has reportedly reached a tentative deal with the Justice Department that would see the bank pay $13 billion to settle civil charges related to wrongdoing by some of its units just before and during the housing crisis. 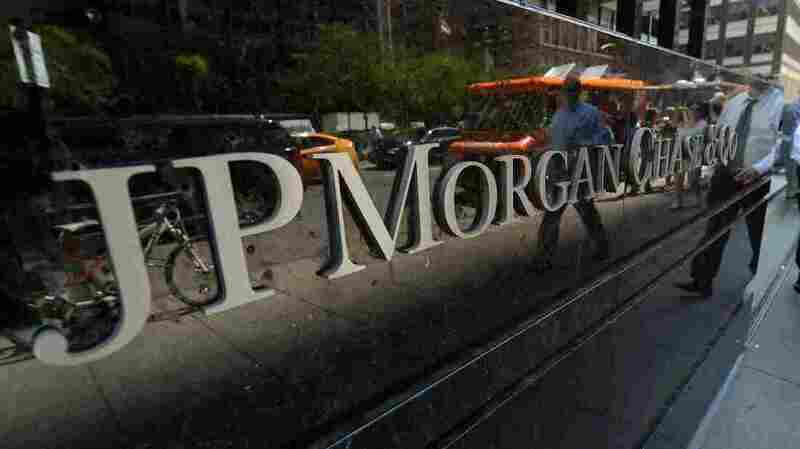 The deal, sources tell news outlets including NPR, would not absolve JPMorgan from possible criminal liability. Word of the tentative agreement emerged around 3 p.m. ET. Saturday. We posted when the news broke and followed with background and more details. Our original post and subsequent updates follow. Scroll down and "read up" if you want to see how the story developed. Two sources familiar with the talks tells NPR Justice correspondent Carrie Johnson that the tentative agreement was reached Friday night and that the language of the deal is still being written. But the sources said the general outlines of what's been reported are correct. The Federal Housing Finance Agency, as Bloomberg notes, "accused JPMorgan and its affiliates of making false statements and omitting material facts in selling $33 billion in mortgage bonds to Fannie Mae and Freddie Mac from Sept. 7, 2005, through Sept. 19, 2007. The regulator said executives at JPMorgan, Washington Mutual and Bear Stearns Cos., which were acquired by JPMorgan in 2008, knowingly misrepresented the quality of the loans underlying the bonds, among other things, according to the lawsuit filed in federal court in Manhattan." "The tentative deal does not release the bank from criminal liability, a factor that had been a major sticking point in the discussions," according to Reuters' source for the story. "The bank would be expected to pay about $9 billion in fines, according to a person briefed on the negotiations. JPMorgan, the nation's largest bank, is also likely to spend $4 billion in relief for struggling homeowners, another person briefed on the talks said." ABC News had previously noted that the settlement was expected to be the "largest-ever payment in the history of financial regulation," topping the "previous record when BP paid out $4.5 billion following criminal charges related to the Gulf of Mexico oil spill." Fox Business calls it the "largest-ever settlement involving a U.S. company." According to CNBC, "Attorney General Eric Holder and JPMorgan CEO Jamie Dimon, along with two lawyers, struck the deal Friday after the market close." Bloomberg News reports that "the settlement amount, which increased from $11 billion to $13 billion during negotiations [Friday] night, the person said, includes a $4 billion accord with the Federal Housing Finance Agency over the bank's sale of mortgage-backed securities." NPR's Business Desk is working the story. We'll update as things develop. "Said to be discussing an $11 billion national settlement with the Department of Justice over mortgage-backed securities. The securities lost value after a bubble in the housing market burst, helping to bring on the financial crisis." Last month, as we wrote, the bank "agreed to acknowledge that it violated federal securities laws and [to] pay $920 million in penalties assessed by regulators in the U.S. and U.K. to settle charges related to the huge trading losses racked up by its London traders last year."